When You're Strange is a 2009 documentary about The Doors. It is written and directed by Tom DiCillo and for the first time makes material from Jim Morrison's 1969 film fragment HWY: An American Pastoral publicly available. 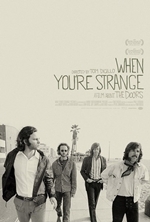 Doors keyboardist Ray Manzarek has stated that "This will be the true story of the Doors," and that the film will be "the anti-Oliver Stone," referring to the 1991 film about the group that Stone directed, and which drew criticism from many Doors fans and several people who knew Morrison. The film was nominated for an Emmy Award for Outstanding Nonfiction Series following its airing on American Masters on PBS. In December 2010 the film was nominated for a Grammy Award for Best Long Form Video and subsequently won the award in February 2011.